Experts say if India backtracks on its support of the Myanmar government's military operation against Rohingya militants, it would be helping rival China gain a stronger footing in the country. NEW DELHI (Sputnik) — Affected by the huge influx of refugees from Myanmar, Bangladesh has urged India to make use of its proximity and friendly ties with Myanmar and convince the country to resolve the ongoing violence in Rakhine state between the military and Rohingya community. In a recent meeting, Bangladesh High Commissioner Syed Muazzem Ali told Indian Foreign Secretary S Jaishankar that India should intervene in the matter due to their proximity with Myanmar government. "India has good relations with Myanmar — they are both members of BIMSTEC. 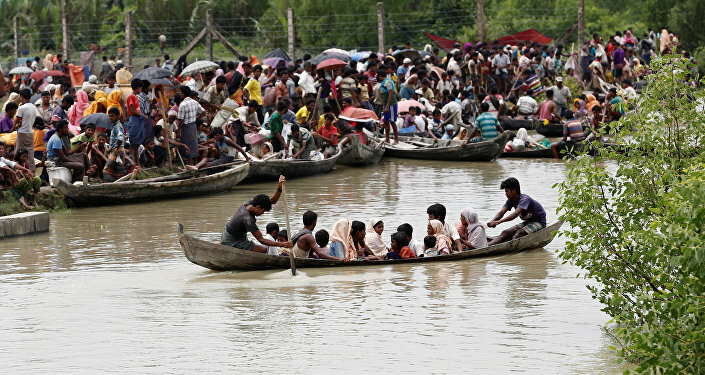 India must emphasize to Myanmar that conditions must be created so that these refugees can return to their country. India can call for the immediate implementation of the Kofi Annan report," Bangladesh envoy Syed Muazzem Ali was quoted as saying by Times of India. Bangladesh is the worst affected by the influx of Rohingya refugees and it wants that international community including India to intervene in the matter so that the crisis is effectively resolved. However, India has made it clear that it is on the side of the Myanmar government. India has also expressed its intent to soon deport Rohingya refugees living illegally in the country. Experts say that the Rohingya Muslims have a tough time ahead as the biggest countries of the region — India and China are backing the Myanmar government. "Rohingya Muslim crisis is likely to deepen further as China has also supported Myanmar government. For India it's a diplomatic challenge as New Delhi will not put pressure on Myanmar government on two counts, first, the Indian government will most likely deport Rohingyas from its soil and secondly, India has supported Myanmar's stand. Further, now there is a China factor also as Beijing has also endorsed Myanmar's stand, therefore India will not go against Myanmar otherwise it will help China to increase its influence in Myanmar," Savita Pandey, Professor of South Asian Studies in JNU told Sputnik.